The launch of Acadian Christmas Traditions by Georges Arsenault will take place from 7 – 9 p.m. on Nov. 16 at the Carriage House at Beaconsfield in Charlottetown. Everyone is welcome to attend. 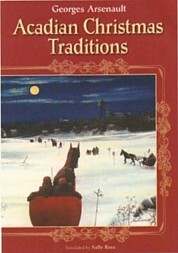 Published by Charlottetown’s Acorn Press (www.acornpresscanada.com), Acadian Christmas Traditions is based on written sources and interviews with Acadians throughout the Maritimes. Author Georges Arsenault, a well-known historian, folklorist and author of several other books (in French) about Island Acadians, examines all the aspects of the feast of Christmas, from midnight mass to holiday foods in this book. As he chronicles the cultural changes that have taken place over the centuries, he proves that Acadian Christmas today is the result of a wonderful blending of old, new, and borrowed traditions. The book was originally published as Noelle en Acadie. It was translated by Sally Ross of Tantallon, NS. It is available in bookstores for $19.95. Saturday Dec. 15 – Indigo Charlottetown, 2 – 4 p.m.